Hai Phong is the well-known and the third largest port city in Vietnam. This is an important sea transportation hub of the Northern key economic region to the world and is gradually asserting to be an attractive and friendly investment environment for domestic and foreign investors. Competent authorities have extensive experience to work with foreign companies. 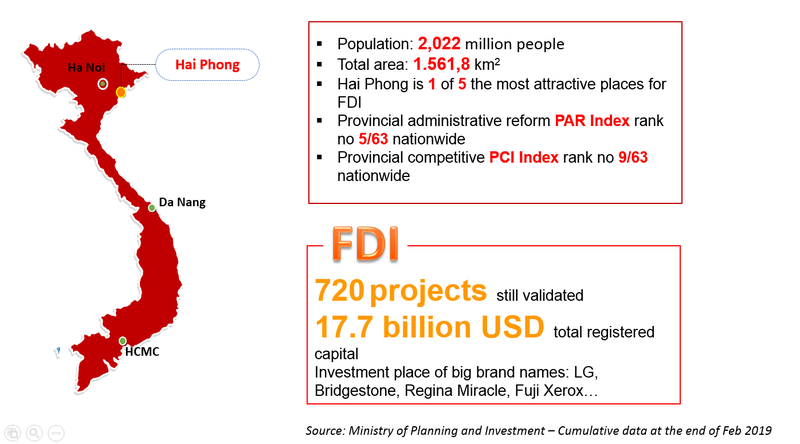 Hai Phong city focuses on the development of regional transportation infrastructure: Ha Noi - Hai Phong expressway, Cat Bi international airport, Lach Huyen international deep seaport, etc. The Investment Promotion Center in Hai Phong was established with the purpose of advising the enterprises on policies and supporting the completion of necessary administrative procedures; recruiting workers, etc. in order to help the investors to reduce time and investment costs. Labor: over 1.2 million labors, mostly young and skilled workers. Training model: 4 universities; 20 colleges and many vocational schools.